Wife of Stannis Baratheon and mother of his only child, Shireen, Queen Selyse is an acolyte of Melisandre of Asshai and zealous in her devotion. A Florent by birth, she is very tall and thin, and with a thin line of hair on her upper lip and protuding ears, she is quite plain. Tara Fitzgerald is notably better looking than the character in the novel. 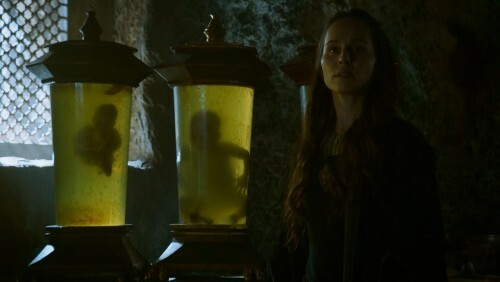 Selyse’s stillbirths and miscarriages of sons may be correct, but her being warped preservation of their bodies and their display in her own rooms is an invention of the show. The role was played by an extra at the start of the second season, but not seen after one brief scene.